In any business, you have to keep track of the tasks that make up a project, and Adventure Works is no exception. They use the Project Management workspace to organize setting up a trade show. Adventure Works is planning for a trade show that they will be hosting next year. 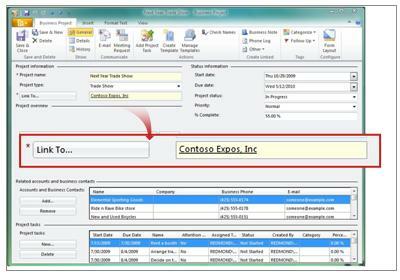 In the Navigation Pane, under Business Contact Manager, click Project Management. On the Business Projects tab, double-click Next Year Trade Show. The Project type is Trade Show. 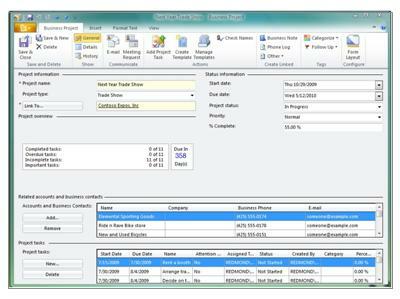 You can customize the list to add the types of projects that your business normally manages. The main contact for this trade show is Contoso Expos, Inc., a specialist in trade shows and conventions, so the project is linked to that Account record. The Project overview section provides a summary of the work to be done and the length of time remaining until completion. The Project tasks section displays a list of the tasks that are required to set up the trade show. A customer, Weekend Tours, has decided to participate in the trade show, so Adventure Works will have to make sure that Weekend Tours has the bicycles and accessories they need. 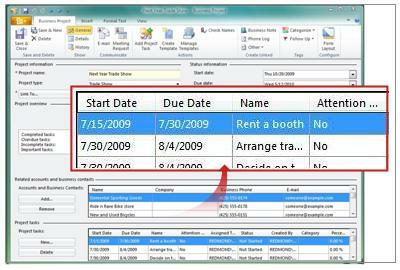 On the Next Year Trade Show Business Project record, in the Related accounts and business contacts section, click Add. 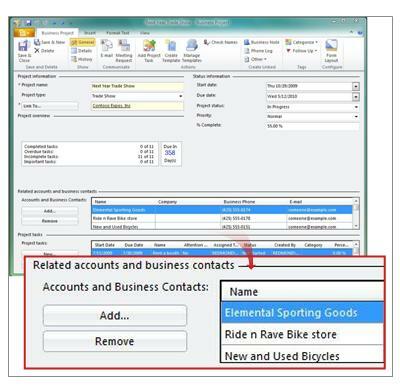 In the Add an Account or a Business Contact dialog box, make sure the Item Type list is set to All Account Types. In the Search box, type Weekend Tours. Click the account name, and then click OK. Weekend Tours is added to the list of related accounts and business contacts. Adventure Works will need a team of employees to run its booth during the five days of the trade show. A manager will have to select the employees and make sure that they book travel and lodging. Arrange travel is already listed as one of the tasks. 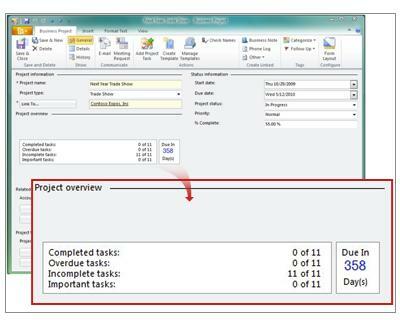 Add a new task – Identify team – to the project and select a due date that precedes the Arrange travel task. In the Project tasks section, click New. In the Subject box, type: Identify team. In the Linked project section, the task is automatically linked to the Next Year Trade Show project. In the Project task settings section, in the Due date box, click a different due date that precedes the due date for the Arrange travel task. Identify Team is included in the list of project tasks. Because Adventure Works hosts several trade shows, they use a template for trade shows, so that they don't have to add the same tasks for each trade show project. On the Ribbon of the Next Year Trade Show Business Project, in the Project Templates group, click Create Template . In the Template Name box, type: Cycling Trade Show, and then click OK. 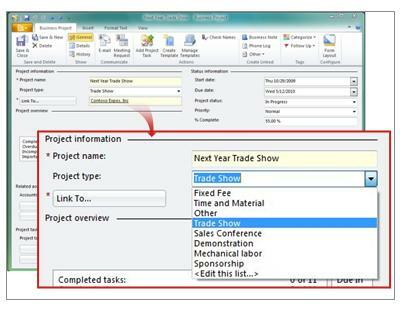 The Edit a Project Template dialog box lists all the tasks that Adventure Works performs to set up a trade show. Click Identify team, and then click Edit. In the Start after (days) box, type: 20. In the Task duration (days) box, type: 5. On the Ribbon, in the Project Templates group, click Manage Project Templates. In the Manage Project Templates dialog box, click Cycling Trade Show, and then click Create Project. In the Project Name box, type Fall Trade Show. Click Link to. In the Link to an Account or a Business Contact dialog box, click Contoso Expos, Inc. Click Link To, and then click OK.
Click OK to close the Create Business Project dialog box. The Fall Trade Show Business Project record opens.